Cordyceps owes its discovery to Tibetan herders, who would observe their goats, sheep and yaks consuming the fruiting bodies of Cordyceps as they grazed in the mountains and over time becoming stronger. Since then it has become an elixir for boosting human potential. In 1993 the Chinese Women’s Olympic Running Team broke three world records, and it was not a result of drug use but the use of the edible Cordyceps. Not only does it increase performance it benefits the body by combating fatigue and fighting off infections and other diseases. Cordyceps are a group of ascomycetous fungus family, with over 400 unique species, it is in close relation to mushrooms, however not taxonomically. It is present on all continents, except for Antarctica. It originated in East/Southeast Asia (Sug, G.H., et al., 2007). The most common varieties that will be seen commercially are Cordyceps militaris and Cordyceps sinensis. It consists of a pale to a vibrantly bright coloured fruiting body with a soft and fleshy stroma. Parasitic in nature, its spores infect larvae or pupae of butterflies, moths or beetles that it comes upon in dried leaves, moss or topsoil. Its stroma originates within the infected host, and the fruiting body eventually emerges often from the head of the insect growing upwards through the soil or undergrowth. The infected larva continues to grow and the Cordyceps consumes it from within over the course of the insect’s development. This usually occurs over the course of winter, when summer approached the spores of the Cordyceps have killed the infected host, the fruiting body has emerged from its head and it releases new spores for the process to occur again (Tuli, H.S., et al. )(Powell, M., 2010)(Sung, G.H., et al., 2007). First written of, by Yilu Wu in 1757 AD during the Qing Dynasty, Cordyceps, particularly Cordyceps sinensis has long been used as an invigorant in Traditional Chinese Medicine (Zhou, X., et al., 2010). Traditionally both the fungus and the caterpillar or insect are consumed within Traditional Chinese Medicine. The various compounds found within Cordyceps such as cordycepin, cordycepic acid and pentostatin, provide beneficial properties to this edible fungus such as anti-fatigue actions, anti-inflammatory, anti-tumour as well as antioxidant (Lou, H.W., et al., 2019). Cordyceps exhibit cytotoxic activity against several different kinds of tumour cells, an action that does not affect normal healthy cells (eds. Benzie, I.F.F., et al., 2010). The anti-tumour activity includes the following actions along with cytotoxicity; a selective inhibition of ribonucleic acid (RNA), apoptosis and immunopotentiation. Cancer cells also express adenosine A3 receptors that cordycepin (a compound found in Cordyceps) binds to. A 2015 study from Japan found that mice who were given 15 mg/kg of Cordyceps a day for a 2 week period had a reduction in the size of their cancerous tumour by 36% compared to untreated mice (Nakamura, K., et al., 2015). Compounds in cordyceps have been shown to increase tumour necrosis factor – a (TNF-a) and interleukin-1 as well as increase the activity of natural killer cells in cultured rat Kupfer cells (Cassileth, B.R., et al., 2003). Beta-glucans in cordyceps aid in reducing the size of tumours as well as stimulating lymphatic function, which aids in cleansing the body of toxins as well as providing cells with nourishment (Isokauppila, T., 2017). Cordyceps also possesses antimetastatic actions, inhibiting the platelet aggregation, a result of APP released from cancer cells. This leads to a reduction of the invasiveness of cancer cells via inhibiting the activity of several compounds (Nakamura, K., et al., 2015). Cordyceps have a positive protecting action on the cells of the kidneys. Its extract has been shown to be beneficial for the improvement and protection against renal failure, as well as improving metabolic disorders and supporting the regeneration of the functional unit of the kidneys (the nephron). It improves kidney function by stimulating renal blood flow, promoting the regeneration of renal tubules as well as preventing chronic renal fatigue (Nie, S., et al., 2018). 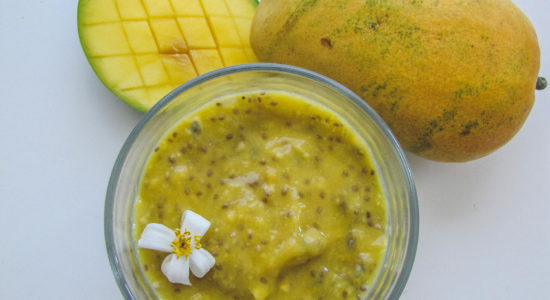 It protects the kidneys via inhibiting mesangial cell proliferation as well as decreasing the incidence of infection of the kidneys, particularly in patients with renal transplants (eds. Benzie, I.F.F., et al., 2010). Cordyceps are applied in clinical practice for the treatment of chronic hepatitis. The fungus aids in protecting against liver disease by enhancing immunological function, particularly in patients with hepatitis B, preventing and reversing liver fibrosis by diminishing scar tissue in livers suffering from cirrhosis as well as reducing free radical damage (eds. Benzie, I.F.F., et al., 2010). The energy that is provided by cordyceps consumption is a result of beta-glucans. They are a type of polysaccharide or sugar found within the fungus. They increase energy by providing more oxygen to the body on a cellular level, this aids in decreasing the occurrence of disease as well as increasing energy and stamina. Beta-glucans boost ATP production in the body, which is another source of energy and required for all cellular function in the body (eds. Benzie, I.F.F., et al., 2010). Beta-glucans combat fatigue by boosting energy metabolism and reducing free radical damage as well as oxidative stress in the body, making it great post workout (Xu, X., et al., 2018). 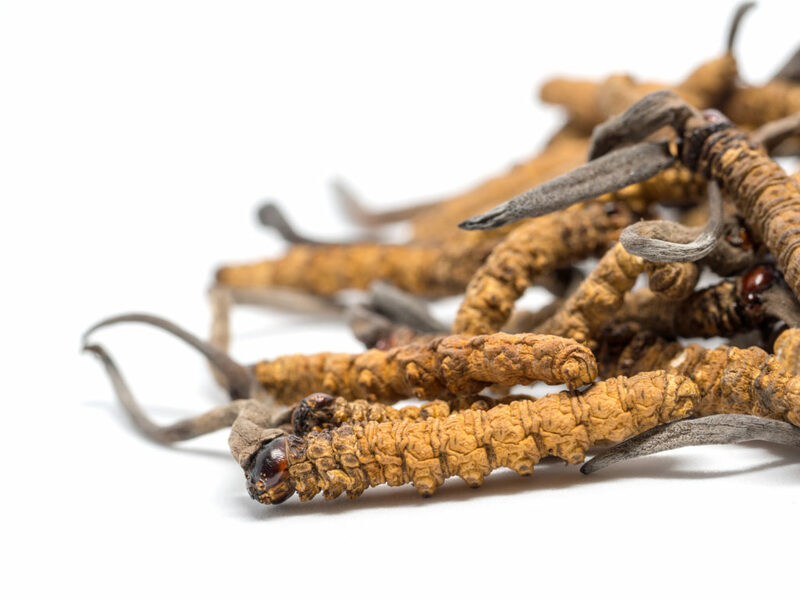 Apart from increasing energy and boosting performance, Cordyceps also aid in reducing and fighting fatigue, both mental and physical. Its adaptogenic properties make it very powerful at combating stress. Chronic adrenal fatigue has also been linked to depression, both of which Cordyceps has been shown to be beneficial for(eds. Benzie, I.F.F., et al., 2010). The presence of cordycepic acid as well as deoxyadenosine aid in boosting libido, assisting in erectile dysfunction, improving testosterone production and increasing blood flow (Isokauppila, T., 2017). Testosterone production is integral for normal sperm function and aids in improving reproductive ability (eds. Benzie, I.F.F. et al., 2010). The immune system in our body aids in protecting us against infection, however when we are stressed or consuming a nutrient-poor diet our immune system can take a hit. Cordyceps aids in boosting our adaptive immune system. Cordyceps both boosts and suppresses the immune system depending on the need of the body – making it a bidirectional modulator (eds. Benzie, I.F.F., et al., 2010). 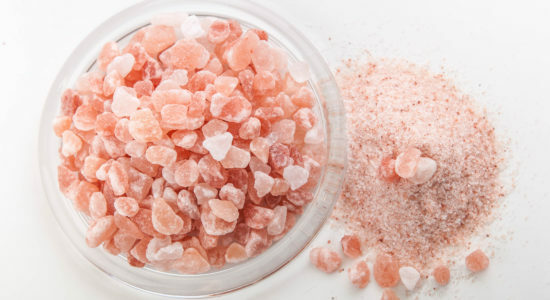 This action makes it very useful in the treatment of respiratory infections as well as cancer. Cordyceps, similarly to other mushrooms, have a positive effect on the gastrointestinal tract. Our GI tract is an integral part of our immune system, primarily due to the presence of bacteria. Beneficial bacteria boosts our health and bad bacteria depletes it, among other things. cordyceps aid in decreasing the presence of bad bacteria, reducing its ability to reproduce by activating macrophages. Along with decreasing bad bacteria, this fungus also aids in boosting beneficial bacteria in the gut, particularly in the small intestine, which can aid individuals suffering from SIBO(eds. Benzie, I.F.F., et al., 2010). Can be used in the treatment of autoimmune diseases, such as Multiple Sclerosis (eds. Benzie, I.F.F., et al., 2010). Cordyceps may be effective against Multiple Sclerosis. Multiple Sclerosis is believed to be the result of T-cell mediated autoimmune response against the central nervous system myelin. When used on an experimental mice model in a 2017 report, it was shown to delay the development of symptoms and resulted in less severe disease, with a clear decrease in inflammation. More studies need to be conducted (Zhong, S.S., et al., 2017). Oral consumption of Cordyceps aids in increasing insulin sensitivity, particularly in diabetics. The fruiting bodies have been shown to improve thymus weight and boost glucose tolerance, reducing excessive thirst and drinking(eds. Benzie, I.F.F., et al., 2010) (Lo, H.C., et al., 2004). Diabetes mellitus, a metabolic disease in which the body is not able to balance its blood sugar level, was found to come under control with the use of Cordyceps as well as other herbal remedies. Cordycepin, one of the main polysaccharides in the fungi aided in the protection and improved function of the kidneys and spleen, both organs that need optimal function for individuals with diabetes. The polysaccharide was also shown to display hypoglycemia actions, regulating glucose metabolism within the liver in a study on diabetic mice (Ma, L., et al., 2015). Protein: amino acids, sterols, ergosterols, polyamines, s-permine, spremiaine, putrescine, 1,3-diaminopropane. Saccharides: D-mannitol, galactmannin (Cassileth, B.R., et al., 2003). Polysaccharides within cordyceps are one of the main health constituents of the fungus. They are mainly present in the cell wall, occurring in the cytoplasm. There are two types of polysaccharides, intracellular (in the fruiting body and the mycelium) and extracellular, the later obtained from culture broth fo fermented cordyceps (Nie, S., et al., 2018). 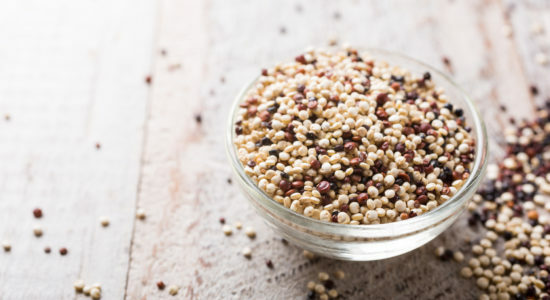 Beta-glucans are naturally occurring polysaccharides. Studies have found numerous health benefits including boosting the immune system, tumour protective properties as well as reducing the absorption of cholesterol and fat by the body (Xu, E., et al., 2018). Cordycepin is the main bioactive ingredient in Cordyceps. It is a nucleoside analogue, interfering with DNA and RNA biosynthesis as well as acting like a potential candidate for the treatment of diseases, such as cancer (Tuli, H.S., et al., 2017). When reading scientific literature of therapeutic practises the term Cordyceps will often refer to Cordyceps sinensis, however, Cordyceps militaris, the variety that is most often found in commercial products and supplements today can readily be used as a replacement as their beneficial properties are very similar (Zhou, X., et al., 2010). A vast majority of the cordyceps available on the market today are harvested on none-insect species, such as grains like rice. This is not only more cost-effective and affordable, but it also ensures quality control. Even though they are grown on a different substance they have the same properties (Powell, M., 2010) (Nakamura, K., et al., 2015). 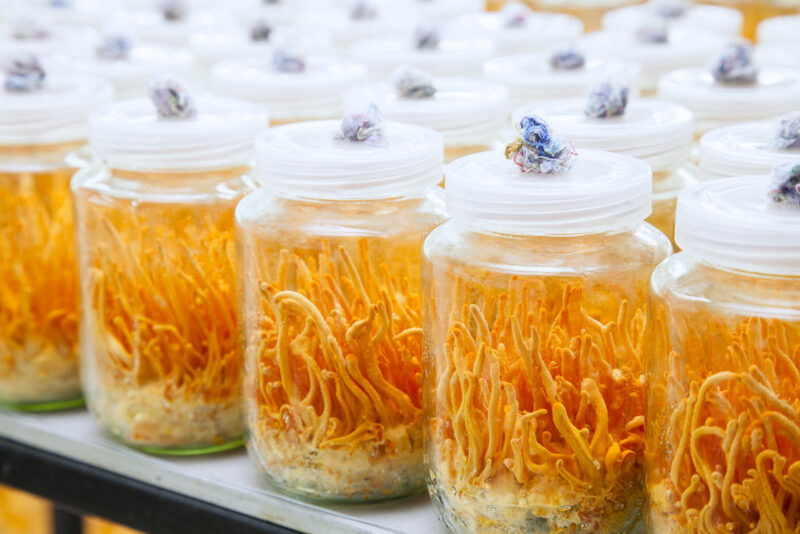 In the 1980s research began on the cultivation of Cordyceps sinensis, the first success came in 1985 when Shen Nanying cultivated fruiting bodies. Commercial production at the time and with the method used was incredibly difficult due to cost and poor stability of the fungi. 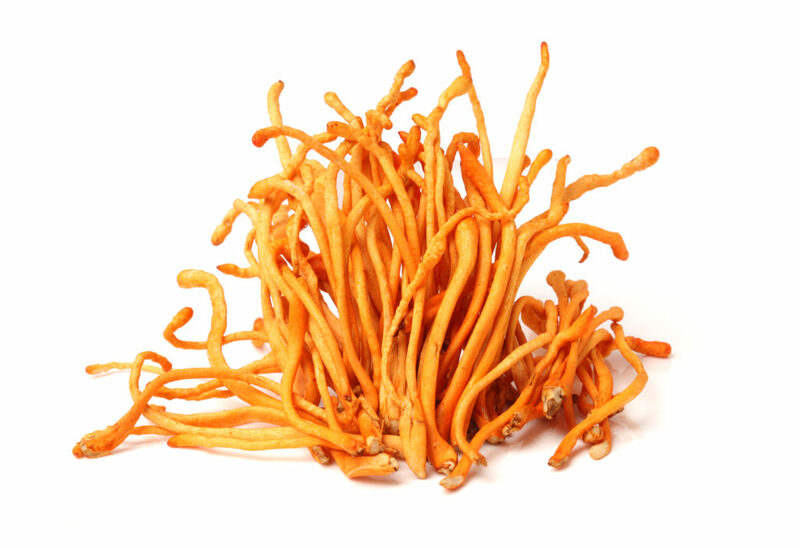 Today Cordyceps sinensis is produced by a fermentation method, but the most common artificial cultivation is the of Cordyceps militaris. It retains all of the properties of C. sinensis but at a much lower cost and higher yield (Zhou, X., et al., 2010). Unless advised by a physician, naturopath or Traditional Chinese Medicine practitioner it is best to stick to between 1-3 grams daily. Some studies may suggest specific amounts for particular diseases or issues, such as 3-6 grams daily for renal or liver disease or 3.5 grams for reaching peak performance. 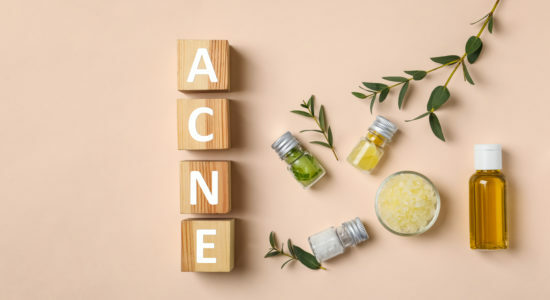 Higher dosages can be safe with the assistance of a practitioner, naturopath or Traditional Chinese Medicine Practitioner (Tuli, H.S., et al., 2014). Though side effects are rare, gastrointestinal behaviour such as dry mouth, nausea, and diarrhea have been reported. Allergic responses are rare but they may happen. In terms of supplementing with Cordyceps during pregnancy and breastfeeding, there is not enough evidence for either a positive or negative result, therefore it is best to speak with your family physician. There are also mixed results for individuals with autoimmune diseases such as rheumatoid arthritis, lupus and multiple sclerosis. For the later, there is research on Cordyceps possible benefit for reducing the symptoms of Multiple Sclerosis, however, more research must be done (Tuli, H.S., et al., 2014). Beug, M., Bessette, A.E., Bessetts, A.R. (2014). Ascomycete Fungi of North America: A mushroom Reference Guide. Utpress: Texas. eds. Benzie, I.F.F., Wachtel-Galor, S. (2010). Herbal Medicine: Biomolecular and Clinical Aspects: Second edition. CRC Press: New York. Cassieleth, B.R., Lucarelli, C.D. (2003). Herb-Drug Interactions in Oncology. BC Decker. Inc: London. Dong, C., Gue, S., Wang, W., Liu, X. (2015). 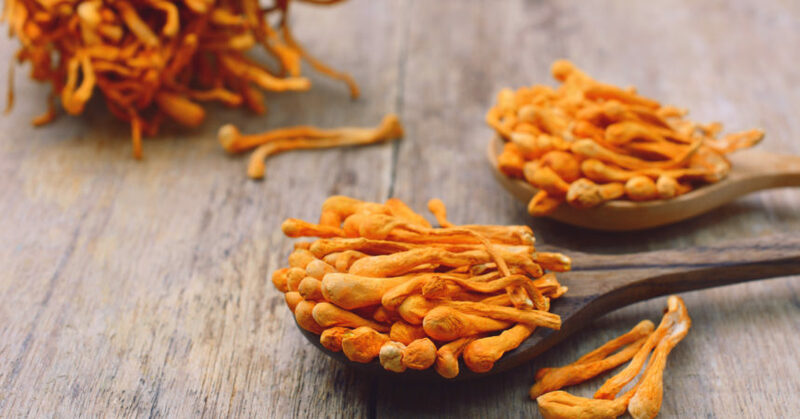 Cordyceps Industry in China. Mycology, An International Journal of Fungal Biology. Volume 6, Issue 2, pages 121-129. Isokauppila, T. (2017). Healing Mushrooms: A Practical and culinary Guide to using Mushrooms for Whole Body Health. Avery: New York. Lo, H.C., Tu, S.T., Lin, K.C., Lin, S.C. (2004). The Anti-hyperglycemic activity of the fruiting body of Cordyceps in diabetic rats induced by nicotinamide and streptozotocin. Life Sciences. Volume 74, Issue 23, pages 2897-2908. Lou, H.W., Ye, Z.W., Yu, Y.H., Lin, J.F., Guo, L.Q., Chen, B.X., Tang, H.B., Wei, T., Chen, L.T., Yun, F. (2019). The Efficient Genetic Transformation of Cordyceps militaris by Using Mononuclear Protoplasts. Scientia Horticulturae. Volume 243. Pages 307-313. Ma, L., Zhang, S., Du, M. (2015). Cordycepin from Cordyceps militaris prevents hyperglycemia in alloxan-induced diabetic mice. Nutrition Research. Volume 35, Issue 5, pages 431-439. Nakamura, K., Shinozuka, K., Yoshikawa, N. (2015). Anticancer and antimetastatic effects of Cordycepin, an Active Component of Cordyceps Sinensis. Journal of Pharmacological Sciences. Volume 127, Issue 1, page 53-56. Nie, S., Cui, S.W., Xie, M. (2018). Bioactive Polysaccharides. Academic Press: London. Panda, A.K., Swain, K.C. (2011). Traditional Uses and Medicinal Potential of Cordyceps Sinensis of Sikkim. Journal of Ayurveda Integrative Medicine. Volume 2, Issue 1, pages 9-13. Powell, M. (2010). Medicinal Mushrooms – A Clinical Guide. Mycology Press. Sung, G.H., Hywel-Jones, N.L., Sung, J.M., Luangsa-ard, J.J., Shrestha, B., Spatafora, J.W. (2007). Phylogenetic Classification of Cordyceps and the Clavicipitaceous Fungu. Studies in Mycology. Volume 57, pages 5-59. Tuli, H.S., Kashyap, D., Sharma, A.K., (2017). Cordycepin: A Cordyceps Metabolite with Promising Therapeutic Potential. Fungal Metabolism. Page 761-782. Tuli, H.S., Sandhu, S.S., Sharma, A.K. (2014). Pharmacological and Therapeutic Potential of Cordyceps with special reference to Cordycepin. 3 Biotech. Volume 4, Issue 1, pages 1-12. Won, S.Y., Park, E.H. (2005). Anti-inflammatory and related pharmacological activities of cultures mycelia and fruiting bodies of Cordyceps militaris. Journal of Ethnopharmacology. Volume 96, Issue 3, pages 555-561. Xu, X., Ding, Y., Yang, Y., Gao, Y., Sun, Q., Liu, J., … Zhang, J. (2018). β-glucan Salecan Improves Exercise Performance and Displays Anti-Fatigue Effects through Regulating Energy Metabolism and Oxidative Stress in Mice. Nutrients, 10(7), 858. Zhong, S.S., Xiang, Y.J., Liu, P.J., He, Y., Yang, T.T., Wang, Y.Y., Rong, A., Zhang, J., Liu, G.Z. (2017). Effect of Cordyceps sinensis on the Treatment of Experimental Autoimmune Encephalomyelitis: A Pilot Study on Mice Model. Volume 130, Issue 19, pages 2296-2301. Zhou, X., Ging, Z., Su, Y., Lin, J. (2010). Cordyceps fungi: Natural Products, Pharmacological functions and developmental products. Journal of Pharmacy and Pharmacology. Volume 61, Issue 3, pages 279-291.